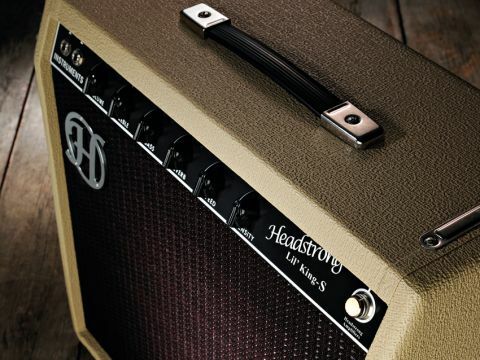 Headstrong's interpretation of one of the greatest amps ever made is loaded with vintage appeal and tone - don't miss out on trying one. Excellent vintage-style construction. Superlative tone when cranked up. The sounds produced by this amp truly don't disappoint. The vintage looks are minimal and attractive. The Lil' King S is a fully valve-powered combo. The reverb is as big as you'd hope. Headstrong is based in North Carolina and California, and for the last eight years it has been carving a reputation for its superb Fender-influenced designs. Like many boutique builders, CEO Wayne Jones started by building replicas of Fender 'Tweed'-era amps, before discovering there was an unfulfilled niche for replicas of Fender's coveted designs from the early '60s - the blonde, brown and 'Blackface' eras. "When it's done properly, the result of this kind of construction is a robust circuit that can handle any amount of abuse and should last a lifetime." One of Headstrong's most popular models so far has been the Lil' King Reverb, its version of the highly desirable 1964 Princeton Reverb. Earlier this year, it unveiled the Lil' King S - a higher-powered version running 6L6s instead of 6V6s, with the capacity to take most popular octal output valves. Clad in heavy-duty blonde vinyl with an oxblood speaker grille, this particular sample is a very good-looking amp indeed. The cabinet is solid pine with lock-jointed corners and nice, evenly radiused edges. The chassis is a robust welded steel box with folded edges suspended from the top of the cabinet by four bolts. The standard of fit and finish is very good, although we'd prefer to see integral or captive nuts on the four bolts securing the steel chassis, as the type Headstrong uses can come loose, even when fitted with locking washers. The electronics are laid out on a fibre eyelet board, which is the traditional way to build a Fender-style amp; the board is drilled with strategically placed holes that are filled with brass eyelets, into which the components are soldered. This is a pure valve design, with no trace of silicon anywhere in the circuit; all you have is resistors, capacitors, valves and transformers. All the valve bases are where they should be, bolted firmly to the chassis. When it's done properly, the end result of this kind of construction is a robust circuit that can handle any amount of abuse and should last a lifetime. The wiring and components hold true to the vintage vibe, using cloth-covered hookup wire and carbon comp resistors, which look nice, although we'd prefer modern flameproof replacements, along with an IEC mains connector. Nevertheless the standard of wiring and soldering is first class, demonstrating this has been put together by someone who knows what they're doing. The Lil' King S's control panel has a pair of high and low sensitivity input jacks and features controls for volume, treble and bass, with speed and intensity knobs for the vibrato circuit and a reverb level control. Around the back, you'll find mains and standby switches, a trim pot for adjusting the bias, a pair of speaker outlets and phono sockets for the reverb tank and the traditional Fender-style footswitch, which toggles the reverb and vibrato effects. We were hoping the Lil' King S would impress us and, armed with its optional Weber Alnico Classic loudspeaker, it doesn't disappoint. Many smaller Fender amps from this era have a distinctive rich clean tone with a slightly compressed attack that flatters practically any guitar and makes the audio seem as if it's expanding out of the loudspeaker. Often known as a '3-D' effect, the result is the amp sounding much bigger than it is, making it easy to fill a room without overpowering other instruments. The Lil' King S captures this elusive vibe very well indeed, going from sweet clarity at lower levels, through a seductive subtle chiming effect that sounds great with warm jazz humbuckers, to a wonderfully responsive Texas- approved crunch once the volume control is parked at 10. Use humbuckers and you can nail those early ZZ Top licks with ease; swap to a Strat or Tele and you can have similar fun with Buddy Whittington or Danny Gatton-style riffs; it's a very rewarding experience and the Weber Alnico Classic's exceptionally rich tones complement the amp perfectly. Volume-wise it's easy to see why Headstrong modified the Lil' King; the 30 watts approximate output coupled with the medium-high sensitivity of the Weber driver provides just the right amount of power and headroom for the average unmic'd gig. Turn the volume and treble on full, adjust bass to taste and control it all from the guitar's volume knob. Back off to six and the amp cleans up exceptionally well. "The Lil' King S provides all you need to copy practically every American guitar part from the '60s with ease." Reverb fans won't be disappointed, as the Headstrong's traditional valve-powered transformer-coupled spring reverb effect is good, but there's way too much level on the control knob, making it difficult to use with precision as most of the usable range occurs within less than half an inch of the reverb knob's travel. The traditionally mis-named vibrato effect (it's actually tremolo) uses the amplifier's bias circuit to modulate the volume level, just like that found on the original Princeton. Later Fenders used an opto- isolator, which for some never captured the same natural quality. Used with restraint this is a powerful and memorable effect that screams vintage Americana to player and listener alike. The speed and intensity ranges are quite wide and provide enough to cover most needs; we'd have liked the speed to go a little faster, but apart from this the Lil' King S provides all you need to copy practically every American guitar part from the '60s with ease and total authenticity, as well as being a killer small amp for blues and classic rock. Beyond any doubt the Lil' King S is an excellent small combo that accurately captures the feel, sound and even - thanks to the cloth-covered wire - the smell of an early '60s Princeton Reverb, with the added bonus of increased power and a much better speaker than the originals ever left Fullerton with. There are three different standard finishes to choose from: in addition to this hybrid blonde with chicken head knobs you can also go for the traditional 'Blackface' cosmetic treatment or Headstrong's interpretation of the much rarer 'Brownface'. Inevitably, such delectable looks and tone come with a premium price tag, which puts the Headstrong beyond most people's reach; at this rarefied level there's also some seriously hot competition from both sides of the Atlantic. However, the Headstrong's blend of vintage features and modifications make it pretty much unique. If you're chasing the vintage dream, here is one very desirable amp that could turn it into reality.